After choosing to follow the big bucks and move to Flamengo rather than his boyhood club of Gremio, Brazilian superstar Ronaldinho was always going to get a rather interesting reception from the Gremio fans when the two clubs finally met. During the game on Sunday (which Gremio won 4-2), the former Barcelona star was subject to much abuse, with shouts of “Judas” peppering the 90 minutes while fans held aloft fake money with Ronaldinho’s face printed on. 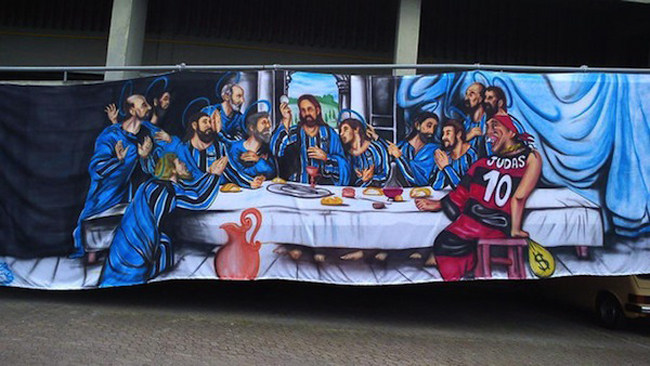 Still, this “last supper” banner was surely the most impressive creation of the lot. There’s a lot of man hours gone in to airbrushing that little baby. All you need is hate. That’s a huge fail on the painting. No human body can twist and turn like that. Especially that fat buck toothed beast. Didn’t Milan already do this to Leonardo in the Milan Derby? How about some originality Gremio! @RyanSSL: Judas tale belongs to everyone.